Apologies for the photos, complete with thumb in corner, but I was busy constantly doing head counts. There were thousands of people and wheeling the pram round the docks while making sure none of the kids ended up in the Derwent River (not to mention the kids in the prams!). 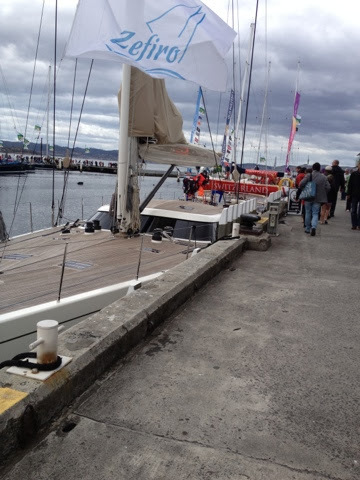 We started off wandering round the Sydney to Hobart yachts. They really are so beautiful and it is quite a sight to see them all lined up on Hobart's spectacular waterfront. We didn't see Wild Oats, but did find Brindabella. Once again no pics, two hands on the pram!! Then off to the taste itself. Taking 4 kids under 7 to the taste was a tad hectic, even by our standards. But thanks to the fabulous Wellses we managed to snag the last table outside. I would love to show you wonderful snaps of all the scrummy food we ate, but as soon as I plunked on the table it was gone. Which was a bit of a let down seeing as each mission for a new plate took roughly 3/4 of an hour. Not to mention the fact that the shed was packed like a sardine tin! On the first trip I stupidly thought I'd take the pram, to keep Rupert asleep. While I used the pram a little like a bull bar, which proved extremely useful, I hadn't thought how I might carry a plate of mixed curry and a bottle of Frogmore Creek wine on the return trip. The curry went down a treat. George inhaled the scallop curry, which had been intended for my dear old hubby. Next trip was for vegetarian spring rolls and satay chicken skewers. The spring rolls were for for mummy. But you snooze you lose. Gone. Ingrid this time. Next trip was lobster risotto and quinoa salad. By this time the kids were full. Ah. Kids fed, time to relax, Frogmore Creek in hand. The sun came out for a bit and the atmosphere was fantastic!! 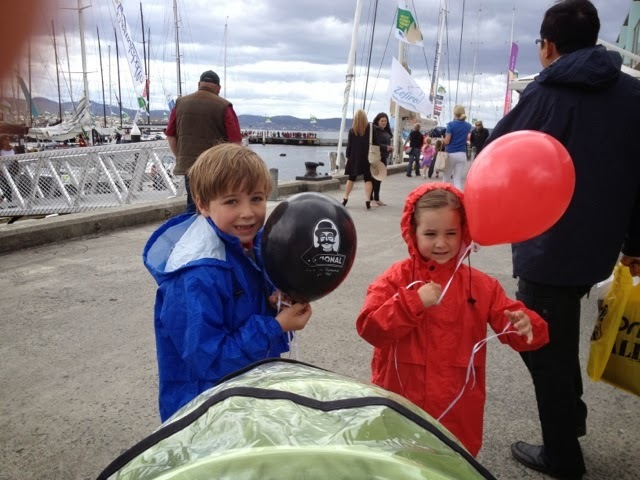 We saw a few boats finish the race and cheered them in which was lovely. It was also really lovely also to catch up with some old school friends-some of whom I hadn't seen for 15 years. I took the kids off to watch some of the street performers. George and Ingrid were absolutely in awe of the tightrope walkers. Once again no pics, I was busy rocking the little boys to sleep. Next icecream. This was the post icecream pic. We went over to the grounds of Parliament House to partake in some of the kids activities. What. 4 pm already? 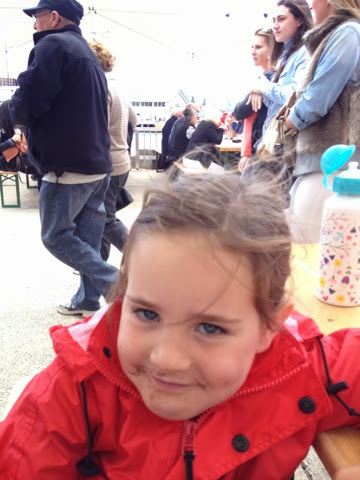 Off we went to Mures lower deck for fish & chips with Grumpa. Pop the kids in their pjs. Drive 2 hours home!! What a day!